Well both of my cars so far already had accidents. Yay it looks like atleast one of my cars is performing well. Slight correction, the Kohlberg car runs a flat 4, not a flat 6. That’s a lot of cars to keep track of! But if anyone’s looking for an industrial lawnmower (or a generator, go kart, or bathroom fixtures), shop Kohlberg! A respectable finish for our privateer team, and a valuable lesson learned by WM. We will need to improve high altitude performance to compete successfully at the Carrera Panamerica. I’m very satisfied with the Montes performance. Straight to the museum. -"Yes I got a message about it, As we know Hurja inst exactly designed to be driven on gravel or snow, and apparently there was some gravel somehow managed to enter the brake drum in the rear, and they were slowly losing brakes on one tire due to it. They tried to make it to end of the stage, but as it was getting worse all the time they had to stop and see what was causing it, and it ended up being very easy fix. -"it’s not not very extensively modified. new carburetors with richer fuel mixture, and ignition timing adjustments on the engine. it allowed slightly more power althuogh ruined economy. On chassis and body we removed rear seats and interior panels, Tires more suitable for gravel, and skidplate to protect the cars bottom. slightly higher and stiffer suspension, Other than that it’s stock. It was a disappointing day for the Homeland Heroes Edward Hampden and Michael Evanham, with a few small faults and some rare mistakes costing the two dearly in their class. Overall they remain in the top ten, and remain optimistic about their chances. Evanham had this to say. Ever optimistic, the young driver was still pushing to his limits as a costly halfspin punctured a rear tyre, leaving the pair helpless as the clocks ticked down on their time. Edward had this to say about the days racing. Edward may be a man with money, but he is still just a single man, and having built and tested the Brooklands all by himself, he is a hero to us all. God Speed and Good Luck from all us at home. The Bricksley Chieftain, piloted by Jake Storm and Cody Acorne, is a strange animal, with its unbalanced 3 head-lighted front. The front of this pick-up truck is essential, as that’s where the drive is. And on the gravel outside of San Martino, the wheels claw and the Bricksley goes. Car number 722, the Civetta Testa Fresca Gran Turismo, has a promising engine, but a first gear (our of four) that almost takes it to top speed does not make it very fast… or fun to look at. At least it stops the wheels from spinning on the gravel. Wilson Marsh and Luke Auburne in the Frankhorn Washington '52 set off. That atypically small block V8 sure sounds nice, and the composure of the large vehicle on the gravel seems to be admirable. The larger of the two Ardent Midnights, #362, powered by an Orion 6 engine, has a nice rumble to it. Performance on the gravel seems lacklustre however. 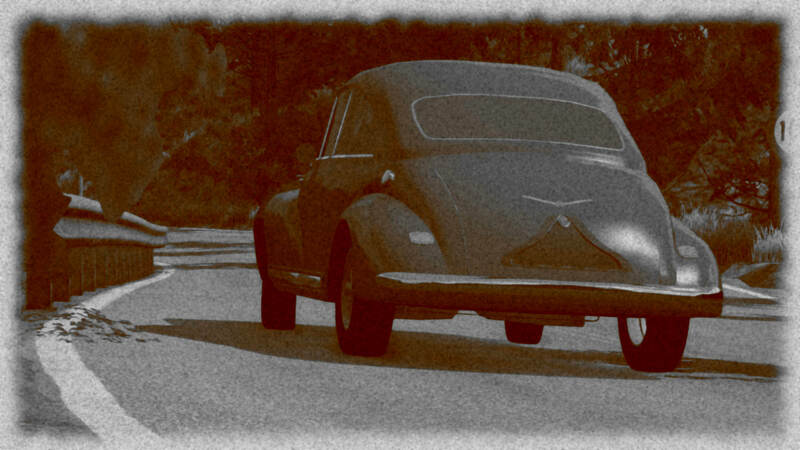 A beautiful car by any standard, the Scagliati 265 Veneto Corsa seeks glory in yet another touring rally course. Scagliati have proven themselves at being masters of the endurance race, and will seek to confirm their reputation here with Mazzanti and Zoccarato behind the wheel. The Arpos Manta RS3.3 carries number 36, and a relatively big engine for a car this small. First impressions are that it drives very nervously on the gravel, with a rear that wildly swings to the side whenever the engine revs. The first of three Puttzalongs is the number 85, another Leeroy project. Betty Wilson and Phyllis Walker at the wheel in a front-wheel drive conversion. This is interesting. Next is the factory Puttzalong Inglese 51, with only small adaptations especially for this Corso, and with a young duo Contadino and Greco at the wheel, but with the distinctive white hood. We also have V8 swapped version of this in the higher category, driving under private ownership. The factory backed one appears to be a very stable vehicle, although low range rev performance from the big four-cylinder engine seems rather lacking. The Juggernaut Automotive Kulkuri, this one powered by the standard inline-6 engine, gets off to a good start. The car looks heavy and planted. What do you get when you couple a military-spec 4x4 delivery truck chassis to a 2.6 liter Boxer-6 racing engine? The LLA TRS200 has to be one of the craziest cars at the start line for this Corso, and the four-wheel drive system immediately proves superior on the unpaved country roads up towards the Arpeninos, resulting in some great photography opportunities. The Falcon Motors Sport GT with number 955 is one of two Falcon motors. This small company makes front wheel drive sports cars, a very uncommon configuration. Little else is known about the company. Jennings and Thomas in the #25 JHW SR250 at the start line now. This is the more powerful of the two JHWs in this Corso. The Caliban Type SC, car number 314 – although the Gutierrez siblings have painted a dot between the 3 and the 14. The kit car leaves San Martino well enough, but on the gravel outside of the principality, there appear to be issues in keeping traction while braking. Nobility at the start of this Corso in the (aptly named) #7 Pfeil-Vogtland Corso. Graf von Hallbach with Squire Hemschler at the wheel of this experimental car from Pfeil. The car, though small in size, has a hefty 3 litre inline-6 powering it. Though a real driver’s car in design, I’d think that the Graf sees a very important role for himself here as well. The Bramble Bismuth “Six” is a car that turns heads. With its rear fins the British sports car looks futuristic and aggressive, and even without the Bismuth is simply a stylish car. All the Sanmartinos… Sanmartinese… Sanmartinian… All the people from San Martino have gaped at this car parked on their central piazza before the start of the Corso. As for the performance of this car with number 95, it’s probably more suited for the paved roads of the latter sectors, rather than the dry gravel roads directly out of San Martino. A local oddity, on the market from 1948, but barely sold, a Boccaccino Silvanae Coupe Speciale Supremo. With a reversed engineered 4x4 drive system and small V8 block, the car is basically a high-revving off-road truck with American styling, rather than a Fruinian sports car as Boccaccino markets it. With this technical background it is perhaps fortunate that the car dons number 777. They might need that triple luck. A front-wheel drive delivery fan with a small 3.2 litre V8, the Aeros Jackrabbit was developed as mail and milk van for rural areas and was sold from model year 1949 onwards. Little wonder does it behave well on the rural roads outside San Martino, as long as driven sensibly, slowly and in low revs. The moment the #47 car goes full throttle, the drive and steering systems go on a strike. 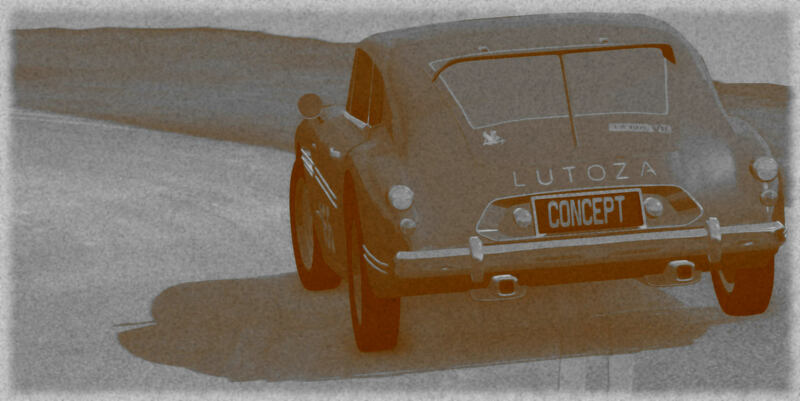 A second prototype of the Lutoza, this time with a small V8. The car is a pretty looking sports car to be developed by some car enthusiasts in a shed in Franco-controlled Spain. This Luxor Privateer is a very special car: made from recycled airplane parts, it is a memory to those fallen in the last world war. It is powered by a large inline-6 engine that produces almost 180 horsepower at the wheels. Heavily adapted for American Baja racing, the WM AeroMouse Panamerica Meyers V8 is powered by a side-valve V8, popular with the greaser-scene in the States. The second BAM Paginza 628 C, but this one with the bigger inline-6 engine, has a decent enough start out of San Martino; at least once it gets going with that very long and languorous first gear. Highly modified and with a loudly bellowing racing engine, the Birmingham Brickham V8 race stand ready to depart. Unbalanced cold race brakes almost cause it to crash still in San Martino, spinning the car out. The tendency to lose control does not diminish once on the gravel country roads. The very young brothers Vincent in a modified Hanson Halberd Mk1. Though of nervousness no sign when they start the long trip in San Martino. Some issues on the gravel roads early on, with the older Vincent probably trying to show off a bit much, but this leads to nothing worse than the occasional foray into the shrubbery. Turns out the Civetta Testa Fresca can spin its wheel, on very steep slopes out of hairpins. So much so even that the clutch needs to cool down before being able to continue. The Frankhorn Washington '52 is quite the mountaingoat it appears. This will be a fast run for them. The engine may be from the 1930s, but this supercharged 3-litre 60° V8 can pull. The Barricada 8c does not always succeed in putting that power down. And it is a true shame to see it trading paint with the rocks and barriers next to the course when slipping about. 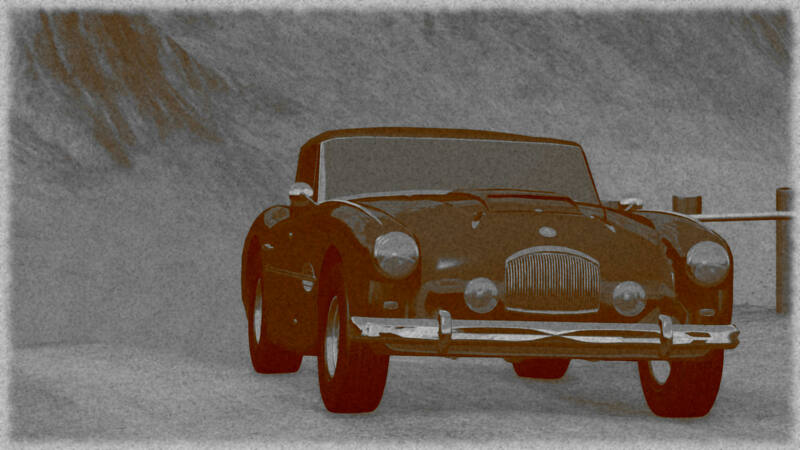 I cannot imagine the driver of the #362 Ardent Midnight having much fun going steep uphill on gravel. The moment you hear the car building up the rpm’s, the wheels start spinning and the car starts crabbing. So far so good for the Scagliati 265. While the car isn’t at home on gravel, Mazzanti does a good job of keeping the rear in check, and we have the feeling he and Zoccarato are in for a fast run. A chronicle of a accident foretold, the Arpos Manta RS3.3 spins out into the guardrail when taking a hairpin on the gravel. It’s a cue to take things even more slowly on the disagreeable underground for this car. There appear to be some issues with the gearbox as well, prompting a service stop. The Puttzalong Leeroy shows that front wheel drive can be a very good alternative for a 4x4 system on gravel roads. The car is stable and can accelerate and turn better than rear-wheel drive cars. Keeping the revs high to get power out of the steep uphill corners the Puttzalong Inglese 51 hits a bump and Contadino loses control. The hit on the front right causes it to spin diagonally over the read. Necessitating a many point turns to get back going. Damage appears to be minimal from a technical point, but aesthetically, the Puttzalong guys will have their work once they arrive in Fienna. 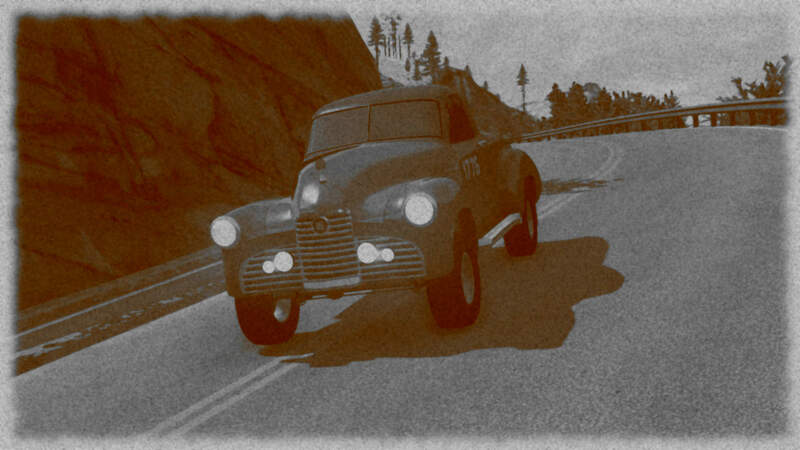 Steady progress for the Juggernaut Automotive Kulkuri, as it continues up into the mountains. The car does not lend itself to much of a sporty driving style, but steady gets there as well. One aspect already causing issues even on this steep uphill section for the number 37 LLA TRS200 is that while the engine has been replaced by that racing engine, the brakes clearly are still those of the 2 litre delivery van it actually is. This does not bode well for the descent towards Fruscany later on. The #955 Falcon Motors Sport GT does not look like an easy car to drive, with heavy steering and torque induced steer when accelerating. Still, that appears to be better than spinning rear tyres on these narrow gravel roads, and the high powered car makes steady progress. Minor gearbox issues for Jennings and Thomas in the #25 JHW SR250. A steady climb apart from that. Nervous but predictable in breaking loose, that certainly beats stable but prone to sudden oversteer. And this is why the #7 Pfeil-Vogtland Corso, driven by Graf von Hallbach and Squire Hemschler is doing relatively well on the gravel roads over the Arpeninos. If it manages to keep this tempo on the icy roads over the tops, there might be a good time in for our noble contestants. It is at times looking scary on the gravel, the way the BAM Paginza 628 C snakes its way up the mountains. There is a small stop to check on the engine, which is making some weird noises in lower revs, but no issues are found. The Birmingham Brickham V8 race is a difficult car to drive on a race track, although I presume there it can be rewarding. On dusty tracks towards snowy peaks, this really is no one’s chosen automobile. The youngest of the Vincent brothers is under the hood of the Hanson Halberd Mk1 just outside of Arpeninetto. The car seems to have some engine issues, possibly the carburettor. Front wheel drive usually means understeer. The future will learn that when these types of cars become widely available. Jake Storm is the number 13 Bricksley Chieftain learns it today as he meets the guard rails. Some time is spent the get the wheel free from the dented wheelhub. Clean run so far for the #772 Civetta, although we notice some severe understeer from the small V12 on the slippery road. Wilson Marsh keeping it simple and careful in the Frankhorn Washington '52. He and Auburne have made it this far without any issues. Icy roads to not mitigate the issues the 1939 Barricada 8c has had in finding traction. The car looks fast, but it hasn’t been so far. Frustration perhaps, that forces the #362 Ardent Midnight to take risk on the icy Arpenino roads, but what doesn’t work on loose gravel, rarely works on ice. 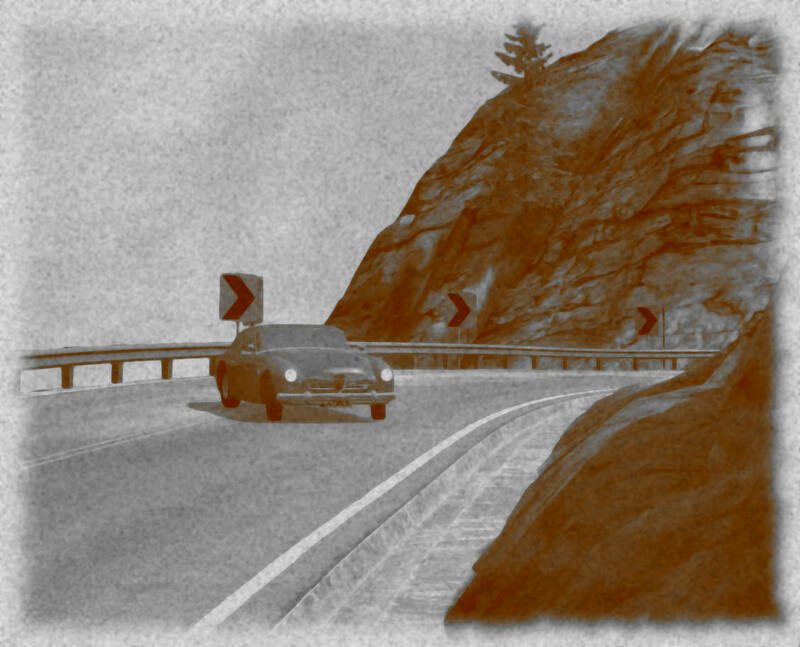 The car is propelled sideways to the rock edge, and though damaage-wise, there is little to worry about, it takes time to get the Ardent free again. Spin for the Scagliati 265 on some ice patches with some damage to the left front. 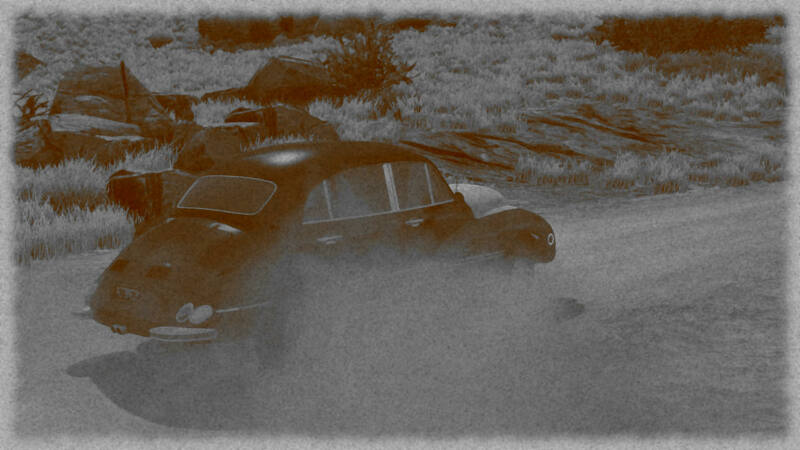 Although nothing serious at first sight, Mazzani stops the car to Zoccarato check if anything important has been hit. Some technical issues for the Puttzalong Leeroy now, they appear to be drivetrain related. Maybe that aftermarket switch did compromise reliability a tad. 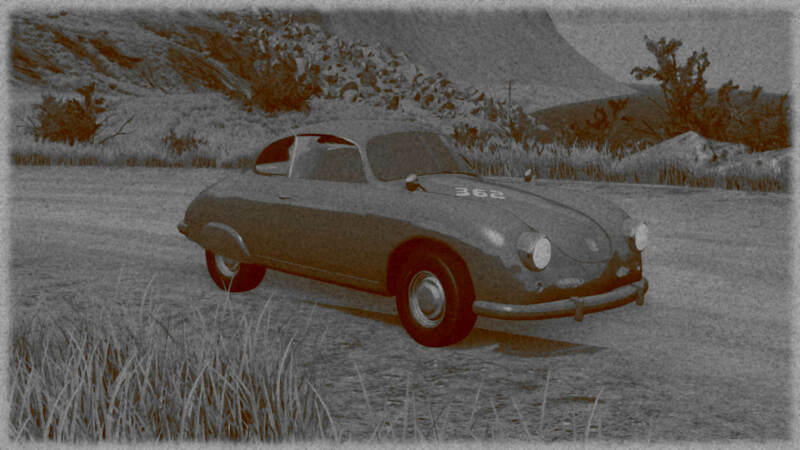 But, Phyllis Walker has proving to be competent as a mechanic, eventhough significant time is lost here. Nothing but issues now for the factory Puttzalong Inglese 51 as the engine simply keeps cutting off. Contadino and Greco have stopped 9 times now and are looking pretty desperate. At this rate, with the distance still to be covered, they might only arrive after the allowed time. Icy roads are a killer for the Juggernaut Automotive Kulkuri. The rear wheels find it impossible to get grip, resulting in many a moment of spinning out for the car. Although no significant damage is taken, the incidents still cause a massive loss of time. Adding to the bizarreness of the design, the Falcon Motors Sport GT has incredibly long and languorous gearing. An issue caused by that is lack of engine breaking on the icy down hill sections in the Arpenino mountains. Here the #955 car misses a corner and crashes into the embankment. A stop is necessary to confirm what damage the incident has caused before the car can continue. As with the smaller #22 car, JHW SR250 driven by Jennings and Thomas has some traction issues on the ice. Going round once, they luckily manage to not hit anything and only lose minimal time. An off-throttle spin for the Gutierrez siblings in the Caliban Type SC. 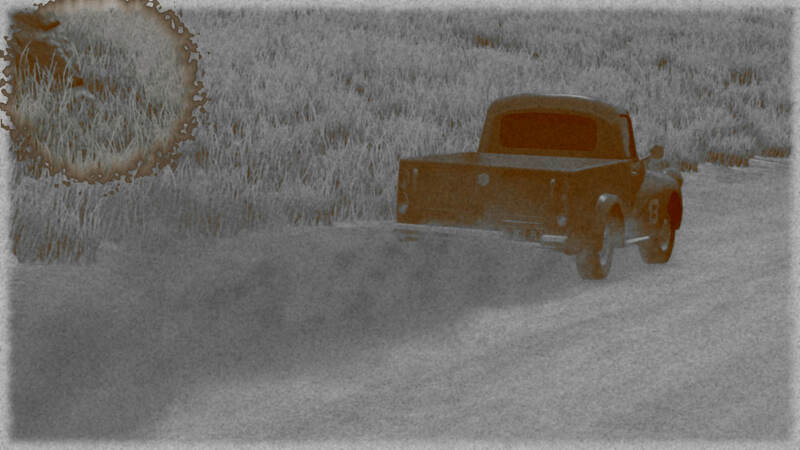 As on the gravel the car seems very stable when accelerating, but becomes dangerously twitchy slowing down. Car 3(. )14 is going to struggle now to set a competitive time. Sudden break failure then for the Pfeil-Vogtland Corso, causing the car to overshoot a corner. Luckily this happened at a part where there was sufficient run off. Less luckily, that run off features decent sized boulders. It’s a most undignified sight to see a Graf on his back among icy rocks trying to straighten steering and a wheel. Composed and civilised performance by the Bramble Bismuth “Six” on the icy roads. A relatively straight part of roads, ice patches on said road, a powerful Boccaccino Silvanae lacking brakes, and understeer. That’s a combination that only end in one way. Luckily the damage does not seem to be terminal. And after some repairs, the car can continue. It does look very skittish on the icy roads. The Aeros Jackrabbit takes every surface as it comes and without issues, as long as it is driven like a truck. There is an issue with a flat tyre high up in the mountains, but apart from that it smooth, but slow sailing. Not all of the power of the V8 engine can really be used, but for the low end torque. Incredibly well behaved from the Lutoza Prot. 02 on the ice, but a bump on the guard rails when the road starts to clear up and some hubris kicks in. Technical issues for the small Giusseppe V8 in the Giusseppe G220 Roadster. Montoya is braving the cold at these great heights to get everything fixed, while Giusseppe is taking notes. The Luxor Privateer is lacking braking power on the downhills, but the car is surprisingly stable on the ice and snowy roads. Once on paved roads the WM AeroMouse Panamerica Meyers V8 has a tendency to oversteer. While the high Arpenine mountains fail to unnerve the car, a tight hairpin lower down catches the giant bumper and drags it off the car, spinning it in the process. Driver and codriver are shaking, but can continue almost right away. We are unsure how the BAM Paginza 628 C still hasn’t exchanged any paint with the guardrails. As on the gravel, the slippery pavement causes the car to wag its tail. It takes great composure of the driver to guide the car down towards the warmer foothills and dry paved roads. It’s a constant struggle to keep the Birmingham Brickham V8 race under control, and a half-miracle the driver has managed so far without any serious incidents. Great driving from the Vincents on these treacherous roads. Less good news is that the Hanson Halberd Mk1 is encountering engine issues yet again, and needs another stop at Previ. The front-wheeled Bricksley Chieftain is actually quite tail-happy on the downhill section, but the big boxered box actually manages as one of the only cars to keep up tempo while driving through the whole stage, regardless of the environment. A small stop near the end to let the large engine cool down was the cause of an additional small delay though. That was a clean run until the last sector of the Civetta Testa Fresca, when the MV Design Racing Team driver miscalculates the effectiveness of the brakes of the car on the downhill sectors and gets a front wheel stuck in the drainage gully next to the road. The car is thrown up against the rocks and suffers significant body damage. The frame and running gear appear to be intact. A bit of time is lost in getting the bolide back on the road with the help of some spectators. Well, the running gear is mostly right, on the Via Fruinia, MV Design realizes some repairs will be in order the coming days; the car pulls to the right at speed. 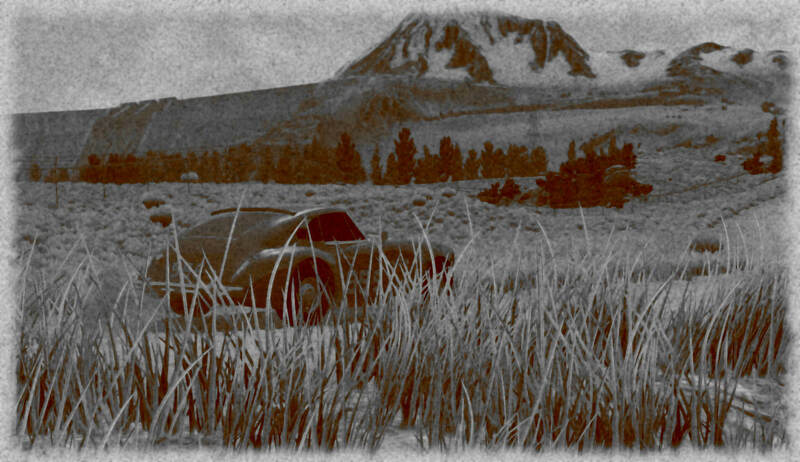 A loss of concentration; momentary distraction or dozing behind the wheel, we will probably never know for sure, but the Frankhorn Washington '52 goes into a corner at way too high speed, and the car gets propelled into a boulder. Amazingly, the bodywork takes the hit and the car can continue towards the finish, reaching dangerously high speeds with a damaged vehicle on the Via Fruinia. It looks like we might have a DNF here as the Barricada 8c loses control and ends up down a small ravine next to the road. Bystanders rush towards where the vehicle disappeared, but luckily see the pilot and copilot surveying the vehicle that still looks drive-worthy. And after scouting a way out back to the road, they can continue towards Fienna. Bad luck follows the #362 Ardent Midnight, as yet another spin, this time on dry paved road, causes the engine to stall. The throttle body needs some coaxing from the mechanic, before the car starts up again. At the finish there is both happiness as well as disappointment in the Ardent team, as the #342 did great, but the bigger-engined #362 finished over an hour and fifteen minutes behind its slower brother. 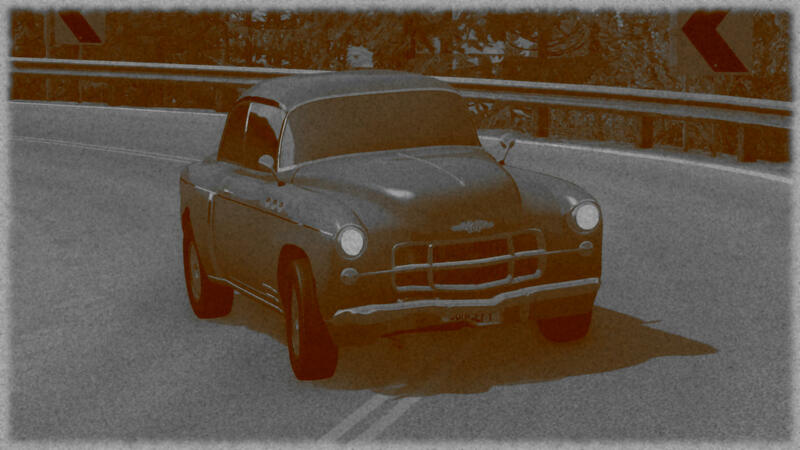 As the road straightens out, the Scagliati 265 picks up speed, and this is where the car truly is in its element. It is on the open road that the Arpos Manta RS3.3 can unleash its full potential. Then you notice quite what a fantastic racing machine this is, tough maybe more suited for the open circuit instead of narrow mountain roads. The factory Puttzalong Inglese 51 is making up time now and can still have a shot at setting a competitive time. And the driving suddenly has become spectacular on the tarmac mountain roads. It is sliding all over the place, but controlled; amazing for such a large car. Maybe some damage was taken by the suspension in going round a few times on the ice. What is sure though is that even on good quality tarmac roads, the Juggernaut Automotive Kulkuri suffers snap oversteer at fairly low speed, making the descent towards the Via Fruinia a daunting trip. Maybe a bit of issues with understeer on the gravel and oversteer without the 4x4 active, and the breaking is sometimes lacking but the modified LLA TRS200 has finished this stage leaving an impression on every spectator. Even in terms of reliability, the car only made a single additional service stop over the whole trajectory; simply to take on fuel, because that racing engine just burns it by the gallon. Lack of engine breaking and being extremely unstable in the high rev ranges even with such long gearing the Falcon Motors Sport GT has more issues on the wider tarmac descent than it had on the gravel backroads. An additional crash into the guard rails damaged the suspension, and from thereon it’s a matter of limping as fast as possible to the finish. While the properly paved twisty roads do seem to be the habitat of the Caliban Type SC, Ana Guttierez loses control in a long sweeping corner when the roads open up. The Caliban is thrown into the bushes and comes to a grinding halt. A damage-inspection from Alejandro later and the 314 car is back on the road, battered, but going straight. No real issues on the final stretch for the Pfeil-Vogtland Corso but the damage sustained to the steering could not be solved by the Graf, so the number 7 car is continuing towards and over the Via Fruinia with diminished speed. A bit of overconfidence by the number 95 Bramble Bismuth “Six” once the roads go dry and open up; a bit too much speed into a corner requires hard braking which unsettles the car and spins it around. Apart from scraping the rocks a bit with the bumpers, no damage done though, and Parks and Burke can continue. The lack of brakes and the damage do not make it an enjoyable drive down the mountain for the #777 car. It is quite a miracle actually that the Boccaccino Silvanae still managed the tempo it did the stage in. 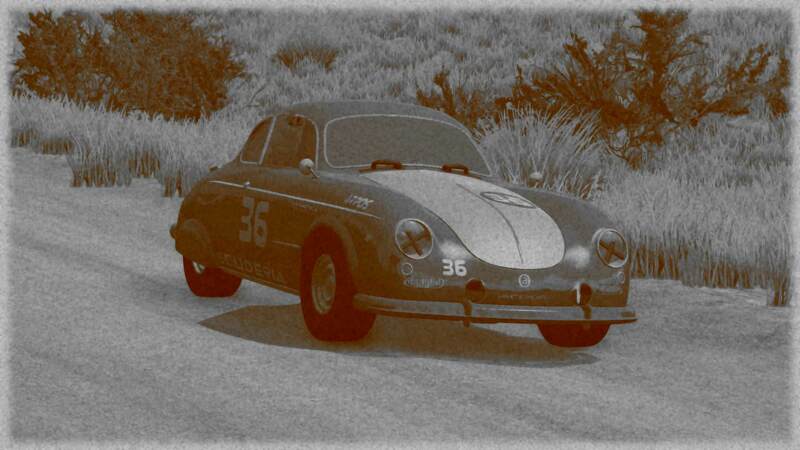 “A perfectly good car, as long as you keep the revs under 2800rpm”, dixit the driver of the Aeros Jackrabbit. No technical issues, a promising drive, and only limited time lost. This was encouraging for the Lutoza Prot. 02. Understeer and sudden fishtailing at high speed for the Giusseppe G220 Roadster, lead to two crashes for Giusseppe and Montoya. The second one the most serious and almost taking out the car completely. It is more on willpower than anything that they manage to drive the car into Fienna. The side-valve Meyers engine in the WM AeroMouse Panamerica Meyers V8 has given a lot. Is no surprise that added to the previous obstacles it tackled, the long Via Fruinia causes it overheat. This costs the Wisconinite team some time before they can finish the last stretch towards Fienna. Audible even for the audience along side the road, the engine of the BAM Paginza 628 C is at times still sounding off. But despite the nervousness this causes for the drivers, the sports car finishes its run over the Via Fruinia into Fienna without any breakdowns or incidents. 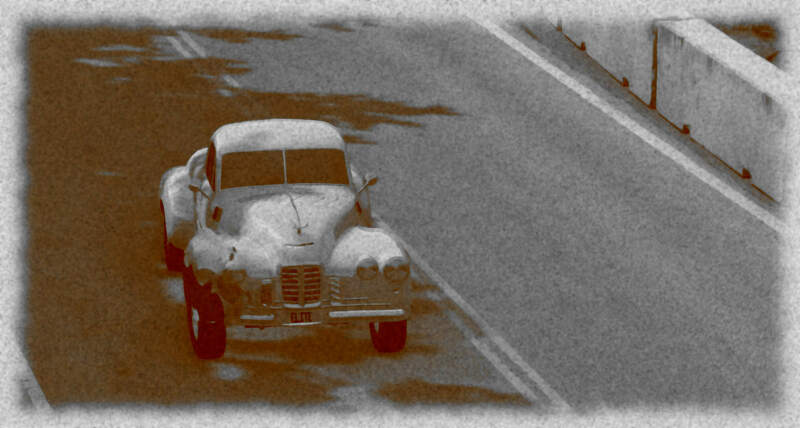 The Birmingham Brickham V8 race craves the straight open road of the Via Fruinia, although the dry paved roads of the foothills are more than manageable as well for the big and powerful car. The final run of the day towards Fienna is for the Hanson Halberd Mk1. No further issues for the big inline-6 pulling the Vincents and running smoothly. The car feels right at home in these twisty roads and onto the big straights. Quick Q @Private_Miros : if the car isn’t mentioned in a sector, does that just mean nothing much interesting happened? A mistake I think? The RPE001 should be the next class up. Correct, if not mentioned, nothing of note took place. Thanks for spotting that mistake, that was a copy paste mistake in my logs for the car in that sector! Considering the issues encountered by almost all the cars… I’ll take that as a good thing! George feels a lump in his throat… He might know something that the company owner doesn’t know. After their run through the first stage, Jake and Cody looked over their ‘borrowed’ pickup truck, a little worse for wear after a day of racing. Jake had abused the gearbox a couple times with terrifyingly loud crunches, not used to shifting on the column, and the paint was chipped in places from being sprayed with gravel. The front right fender was crinkled, beaten straight with a couple sturdy rocks to get it out of the wheel, and they’d overheated badly when Jake had forgotten the truck’s relatively low redline on the way down the hill, belting the engine to pull the thing straight when the back kept getting sideways. “So… We crashed, fixed it, overheated it, fishtailed all over using the engine to pull us straight, and, well… How did we finish?” Jake asked. “Well, that’s good. Plus, it helps we both know how to handle front-wheel-drive, though the understeer is way worse than I expected. And how the hell do people drive these things with all the jerking and shoving and yanking on this stupid three-speed gearbox?” Jake said. “Yeah, and that’s with you flooring the gas to keep the back end under control. I think we might’ve passed a few of the actual racing teams in that, with our headlights glowing and the high-beam lamp burning bright.” Cody said, giving a smirk.